Posh Rulers Blue Height Indicator Tape. Made in USA. Available in four different colors, our Height Indicator Tapes are proudly made in the USA. Made of a high-tech material suitable for indoor & outdoor applications, in all weather conditions. Posh Rulers have a long usable product life (minimum 5 years). Made of a special material that incorporates air-release technology, this non-rippable material is truly user-friendly and means that any creases, or bubbles, can easily be rubbed smooth. Like a sticker, just remove the tape from the backing and apply to a clean surface. Flat wood, painted wood, walls, metals, office door frames - they're not a problem for these Posh Rulers. The width of the tape has been designed to easily apply to the standard 1 ½ inch wide door frame seen all over the world in offices, entrances, houses. But the material is so durable it can just as easily be applied to poles, railing, boat railing, vehicle bodywork (ambulances), and other curved surfaces. The tape can even be applied to wall corners, useful if you have multiple security cameras at home. Household scissors can easily cut the tape to fit the height of your door frame, if seven foot is too tall. 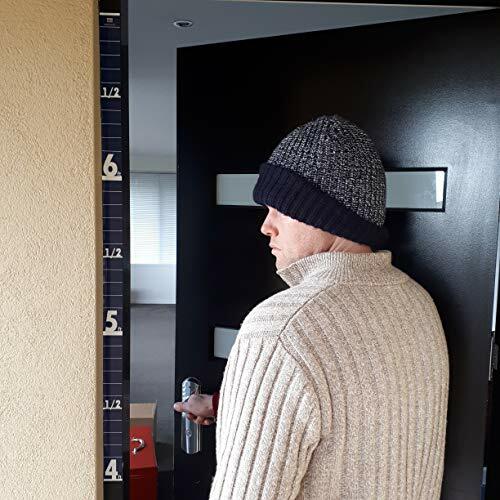 Designed to show a persons height in inches, Posh Rulers work well with surveillance cameras, photographic cameras and the like. Feet are the dominant markings on the tape, but centimeters are discreetly marked on the right hand side. Steps to apply: provide a clean, dry surface. Then roll out this tape and use it to mark and measure four foot from floor level. Then, like a sticker, just peel the tape away from its backing and apply. DO NOT STRETCH. JUST APPLY & RUB IN FIRM. The tape can be re-applied. The material will not remove paint, provided the paint is not an undercoat. Maximum adhesive strength occurs 24 hours after application. Thank you for considering Posh Rulers. Posh Rulers is a trademark of Posh Lines and we are proud to have all our products made in the USA. Special high-tech material means a long product life, both indoors or outdoors and in all weather conditions. Boldly marked in feet from 4 to 7 foot. Discreetly marked in centimeters on the right hand side. Dimensions are 1 1/2 inches wide by 36 inches long & can easily be applied to walls, door frames, metal, painted finishes, curved surfaces and cut to size. If you have any questions about this product by Posh Rulers, contact us by completing and submitting the form below. If you are looking for a specif part number, please include it with your message.